Discussion in 'General Discussion' started by rmaster581, Oct 20, 2013. Hi, everyone. My name is Rocket. I played EA-Land. Hello, Rocket! Welcome to Project Dollhouse. If you have any questions, just ask. Xezno, what happened to your TSO project? I thought you had one too? Sounds like a plan, xezno. Just be aware that C and C++ are generally considered to be quite tough languages, and you'll end up spending quite a bit more time than if you had done something in, say, Java. HOWEVER, you're in luck, since you can just branch off of NIOTSO! What language is Project Dollhouse in, or can I not branch off that? Project Dollhouse is C# using XNA. I'm getting increasingly worried about support in the future, because Microsoft has dropped support for and stopped developing XNA. Though XNA apps can still run in Windows 8, just not in Metro. But Monogame is getting increasingly stable, so chances are that the final version will be built using it. Hello Hayran, welcome to the community. All of the beta testers in The Sims Online were given founder status. It was a big deal to us all back then, http://www.tsomania.net/specialfeatures/1000days.php. Awesome - would you like to BETA test xTSO? Founders are TSO beta testers. 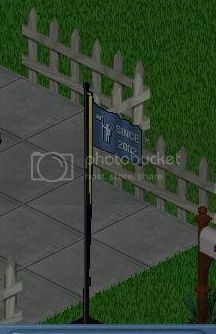 If you are a founder your profile had an emblem of a stick man holding a flag, kinda like an MTV music award, along with simmys. I'm a founder as well. Here's what it looked like. this is the founder flag that got cut off the picture above, I would like to beta test. Cool - I might implement "Since 2014" lol (that's the release date) and BETA testers from now on will get a "Veteran" flag too. PM me the username and password you'd like to use for xTSO and I'll put it in the server auths. The next release will be tomorrow, for updates 1-4 look at xeznotso.prophpbb.com - Update 5 will be the best!